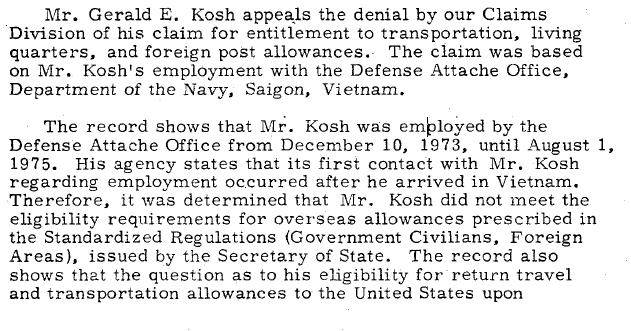 This is a true footnote character from history. 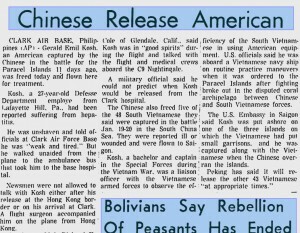 I’m reading google news and there is a story about a potential war between China and other countries over ownership of the ecologically sensitive, oil-rich South China Sea and it mentions a battle between South Vietnam and China in 1974, just after the US had cut and run from Vietnam but before the North won the war. 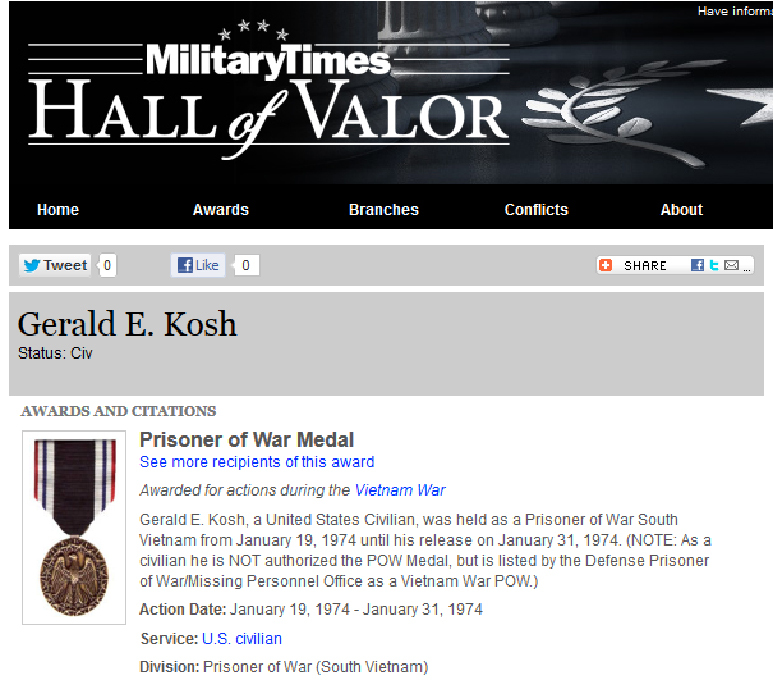 Thats interesting, so I look it up on Wikipedia, and there is Gerald Emil Kosh. That is an unusual name so I was able to track down a lot of weird stuff. 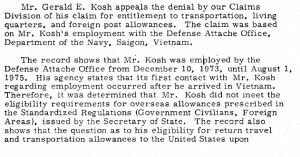 Kissinger talked to the Chinese, the government later denied he was an employee, his military record is listed ambiguously. He went on to live a quiet life, and this incident was not mentioned in his obit. 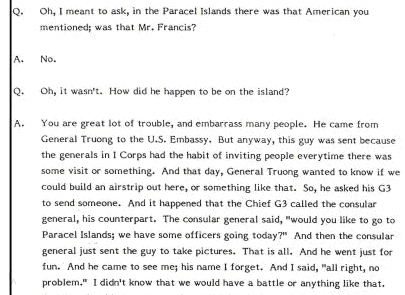 His name got tossed out to Obama by a South Vietnamese dead-ender waving the bloody shirt. To this day he is on E-bay and possibly Facebook. The Battle of the Paracel Islands was a military engagement fought between the naval forces of the People’s Republic of China (PRC) and the Republic of Vietnam (South Vietnam) in the Paracel Islands on January 19, 1974. 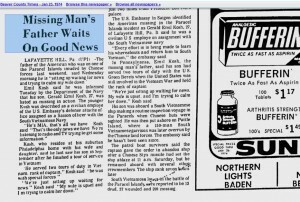 Washington, January 23, 1974, 6:15–6:45 p.m.
[Secretary Kissinger]… there are only two points I wanted to make with respect to the Paracel Islands issue.2 The South Vietnamese government is making a number of representations to international organizations, to SEATO as well as to the United Nations. We wanted to let you know we do not associate ourselves with those representations. We are concerned, however, about the prisoners, and we noted that your government has indicated that the prisoners will be released at an appropriate time. We wanted to urge that this appropriate time be very soon, especially as there is an American included in that group. And that would certainly defuse the situation as far as the United States is concerned. That’s really all I wanted to say about that issue. (To Mr. Hummel) Or is there more, Art? Mr. Hummel: For domestic political reasons we would like to say that we have been in touch about this American. As for when the prisoners will be released, our statement said that at an appropriate time they will be released. It was the Foreign Ministry statement. But as a personal observation, I would just like to express surprise that there should be an American citizen at that particular area at that particular time. 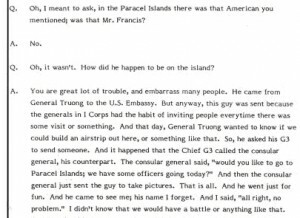 Ambassador Han: With regard to Mr. Hummel’s suggestion whether to publicize this to the media would this be quickly, right away? 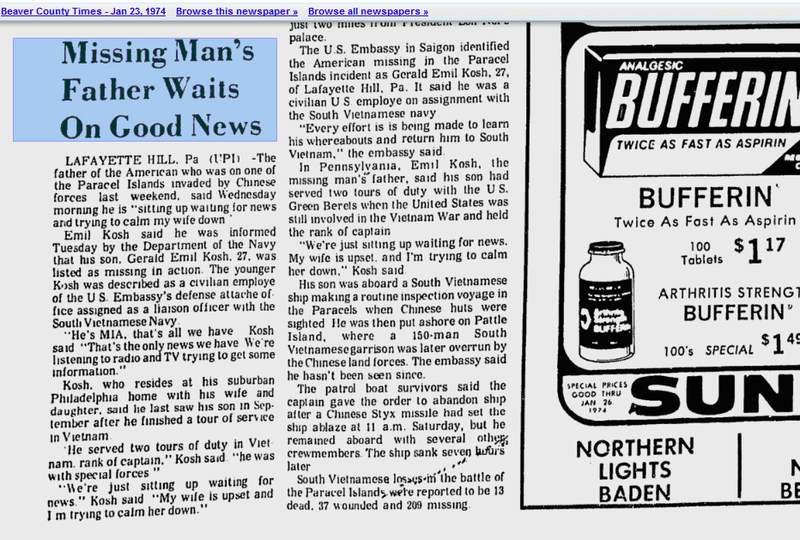 The Secretary [Kissinger]: We can wait. What do you want? You report to Peking. Not having said anything up to now, we can survive another 24 hours. We can take the heat. We will give it until Friday morning,3 but the more quickly you can let us know, the better. Eventually, we will have to say that we have talked to you. Ambassador Han: After we have reported to the government, we will see what the reply is. Mr. Hummel: All we have in mind is to say that we have talked, not to make the other points that the Secretary raised. The Secretary: We will wait until Friday. We can give you until Friday a.m. to see whether you get an answer. We have been accused of so many things, we can be accused of neglecting an American interest for a day. Gerald Emil Kosh, 56, died Sunday. He was born Oct. 25, 1946, in Philadelphia. 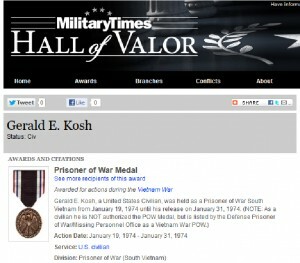 An Army veteran of the Vietnam War, he was a journeyman wireman, a 17-year resident of Las Vegas and a member of International Brotherhood of Electrical Workers Local 357. He is survived by his wife, Susan; daughter, Jennifer; and son, Jonathan, all of Las Vegas; brother, Gabe of Blue Bell, Pa.; and sister, Arlene McElree of Lafayette Hill, Pa.
Visitation will be from 3 to 7 p.m. today at Palm Mortuary-Eastern, with services at 10 a.m. Wednesday at St. Anne’s Catholic Church. Graveside services will follow at noon at Southern Nevada Veterans Memorial Cemetery. We are writing to ask you to halt or postpone the welcoming ceremony and the state dinner for the People’s Republic of China (“PRC”) president Hu Jintao on January 19, 2011 during his visit to the United States. 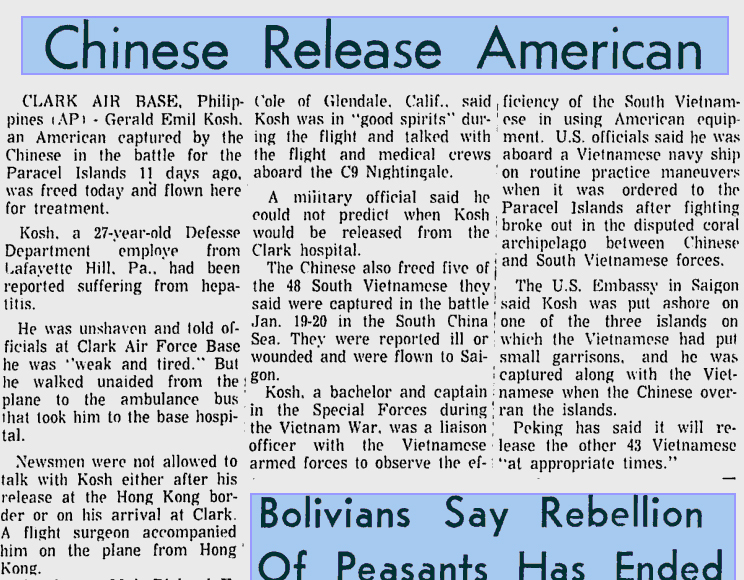 January 19 is the anniversary of the Chinese invasion of the Paracel Islands which had belonged to the Republic of Vietnam, an ally of the United States then. 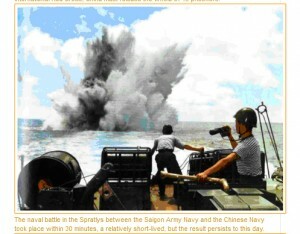 After the fall of Saigon, China established control over the Paracel Islands. 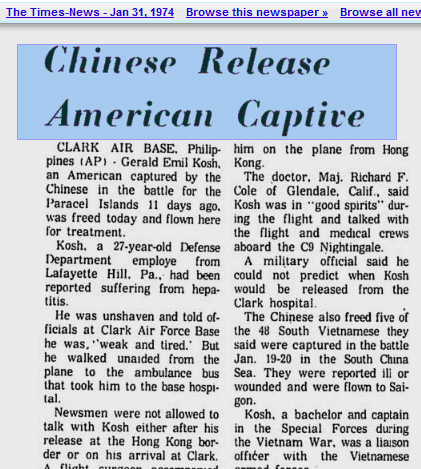 Please do not forget the fact that on January 19, 1974, Chinese forces had also captured an American, Captain Gerald Emil Kosh, during the battle for the Paracel Islands.